Spiritual formation is a lifelong process towards discipleship that is living, fruitful and essential. Prayer, conversation, books, gaining knowledge from a teacher, experiences, encounters with others, reading, watching, listening, etc. are all thing that happens along the formation continuum. Following are highlights from our 10:15 a.m. Sunday Morning Adult Formation Opportunities, as well as weekday formation classes. Questions about Adult Formation and Confirmation? Contact Fr. Chris Cole at Chris.Cole@StMarysArlington.org or call 703-527-6800. 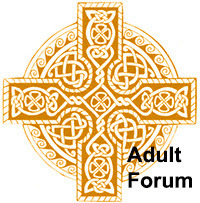 Adult Forums are a series of thematic lectures from clergy and visiting guests. Adult Forums run between Sunday morning services, from 10:15 a.m. to 11:00 a.m. in Paca Hall during the months of September through May. Nursery and Sunday School run concurrently with Adult Forum; therefore childcare is provided through these ministries. Fellowship coffee hours fill in when we are between formation themes or marking a parish celebration. Check our weekly E-Updates for a preview of our next Adult Forum. Parents of children and teens may drop in on this formation elective Sundays from 10:15 to 11:00 a.m. in the Vestry Conference Room, located downstairs from the Nave. Led by parents, this discussion series leverages short articles to assist parents in navigating the sometimes anxious and always surprising path of parenting. Online links to the articles are included in our weekly E-Updates. The Art of Parenting is an occasional formation offering during the fall and spring. Check our weekly E-Updates for a preview of our next Art of Parenting session. You are invited to make St. Mary’s your church home. If you would like to learn more about St. Mary’s and the Episcopal Church, please contact Fr. Chris Cole at Chris.Cole@StMarysArlington.org or call 703-527-6800. Additionally, twice a year, we host a four-week series in our Chapel at 10:15 a.m. to allow newcomers the opportunity to learn about the history and story of our parish, how we worship, what we believe, and how individuals and families can connect to the life of the parish and our many outreach ministries. Baptism, Confirmation, and Reception in the Episcopal Church are part of one’s spiritual journey. This course is for individuals aspiring to deepen their understanding of God, the Church and the Holy Spirit’s presence in their life. This seven-week class is offered once a year in the Fall and will be listed in our weekly E-Updates. If you would like to be added to the next Episcopal Membership roster, please contact Fr. Chris at Chris.Cole@StMarysArlington.org or call 703-527-6800.